Laptop Notebook DJ Screen Stand Mount. Computer Desk, Writing Desk, Sketchpad, Board, Dining Table, Etc. Laptop Screen Size 10-16". Material Aluminum. Model Number: PLPTS35. Light Weight Sturdy Unit Folds Flat to be Convenient and Portable - Folding Instructions Included. Portable Speakers. Portable DVD. Anti Freeze. Our system will hold any order with a note attached to it pending review by the dispatch team. Bullet Points: - Tilted table top option for comfortable typing or writing with modern elegant and graceful condition. - Table height is adjustable, dual surface with ergonomically-positioned pad table matches to any wireless mouses. - 2 lockable omni-directional casters make it both mobile and stationary. - Safety edge-stopper to prevent objects from sliding off when the panel is tilted. - Ideal for working with your laptop or tablets beside beds or sofas, or as a movable workstation when giving a presentation at the office. Specifications: - Material:Metal - Color: Black - Weight Capacity: 1.5kgs All Dimension is manual measurement value which could exist a little error,Please understand and thanks for your kind support!. Robust, yet Lightweight and Portable. Maximum Load (kg): 15. Adjustable Height and Tilt for a Perfect Fit. Quick, Easy Assembly. Material: Steel. PRODUCT INFORMATION. Stagg DJS-LT10 Professional Portable DJ Disco Adjustable Laptop Stand Black. Sefour X15 XD150-901 Portable Compact Studio Console DJ Deck Stand Gloss Black. Citronic Compact Portable DJ Disco Adjustable Laptop Stand (with Desk Clamps). Novopro FPB1 Foldable Portable Booth. Unique design of the top panel and hinges gives a much more stable working platform than other foldable booths - a very solid and sturdy working area, whilst still being fully portable. The ultimate solution for DJ's looking to incorporate a laptop or notebook computer into any DJ set-up. 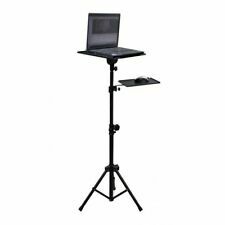 The ELV Laptop-Stand is a solid, completely demountable and portable DJ-equipment stand to support your laptop (12 inch -17 inch ), CD-Player, Keyboards, Loops-Unit, Controller, EFX-machine or other extra gear you may require for your live or home studio performance. The space-saving Laptop-Stand allows you to custom- elevate your laptop over the DJ-setup whereby an easier access to the equipment is provided. What do we think? Its a portable, height adjustable, self assembly flat laptop stand with a Free carry bag. Numark Laptop Stand Pro Portable DJ Performance Stand (Black) inc Warranty. Professional Event Table to use as a greeting table, sales table, live sound or lighting designer console or DJs. Max table load: 30 kg. Front board to add custom graphic (Size W x H : 25" x 22.5" / 635 x 571,5mm). Can be assembled and any of the 4 possible height settings and 3 of the possible width settings. Also includes a desk clamp option for attaching your laptop stand to a table, desk or shelf. Compact Laptop Stand. SSL stand is quick and simple to put up and all the fixtures and integrated into the stand. This SSL Stand is a heavy-duty steel tripod speaker stand. Unlike many cheaper speaker stands, SSL Stand is built from powder-coated steel which makes it one of the strongest stands in its' class. Portable Laptop DJ Notebook Stand Mount Desk Computer Table For Screen 10"-16"
Laptop Notebook DJ Screen Stand Mount. Computer Desk, Writing Desk, Sketchpad, Board, Dining Table, Etc. Laptop Screen Size 10-16". Panel Thickness 3mm. The Crane Stand Plus. 1 x Crane Stand Plus. Fully adjustable, lightweight and portable. If there's a problem, just let us know and we fix it. Height adjustable from 17 - 34 cm. We do our best to process as quickly as possible. In the case of factory defects, we will replace the product for you.